Located opposite the train station in car-free Murren, which is only reachable by cable car from Lauterbrunnen valley, Hotel Eiger is an attractive, traditional alpine style hotel and has been owned and managed by the same family since first opening in 1886 and there is a friendly atmosphere and personal touch making guests feel at home. Its stunning location affords views over the majestic Eiger, Monch and Jungfrau mountains and modern style guest accommodation make the most of the hotel’s lovely setting with superior rooms benefitting from a balcony; uniquely themed suites include the decadent James Bond suite and a spacious loft suite. A selection of hot and cold dishes for breakfast ensures a perfect start to the day and for dinner the elegant Eiger Saal restaurant offers a la carte choices or a five course menu for those on half board, alternatively the more rustic Eiger Stubli features regional specialities paired with good wines. Wonderful mountain views can be enjoyed from the indoor swimming pool and Jacuzzi in the wellness area. 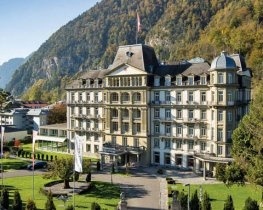 The hotel is well situated for excursions to the Schilthorn and Jungfraujoch. Much celebrated in On Her Majesty’s Secret Service, the scenes from the top of the Schilthorn are fabulous, as is lunch at slowly revolving restaurant, Piz Gloria. The interactive Bond World 007 exhibition is a lot of fun for everyone too. Using your half fare card (included with your holiday transfer rail tickets), prices are from £34 per person. Advance booking with our concierge service is recommended. For selected stays between 18 April 2019 & 06 October 2019 receive 1 free night in 7. Free Hiking map. Explanations of hiking options with accordance to weather provided also in the Summer period. for bookings made between 18 April 2019 and 18 December 2019 and completed between 18 April 2019 and 18 December 2019. Prices apply to all rooms.